^ 2.0 2.1 Landes, David. Swedish becomes official 'main language'. The Local (Se). 1 July 2009 [8 July 2017]. ^ Scandinavia. WebCite的存檔，存档日期2009-11-01 (2006). Microsoft Encarta Online Encyclopedia. 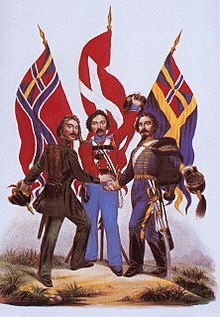 Retrieved January 30, 2007: "Scandinavia (ancient Scandia), name applied collectively to three countries of northern Europe—Norway and Sweden (which together form the Scandinavian Peninsula), and Denmark." ^ Scandinavia. (2007). Encyclopædia Britannica. Retrieved January 31, 2007, from Encyclopædia Britannica Online: "Scandinavia, historically Scandia, part of northern Europe, generally held to consist of the two countries of the Scandinavian Peninsula, Norway and Sweden, with the addition of Denmark." ^ "Scandinavia" (2005). The New Oxford American Dictionary, Second Edition. Ed. Erin McKean. Oxford University Press, ISBN 0-19-517077-6: "a cultural region consisting of the countries of Norway, Sweden, and Denmark and sometimes also of Iceland, Finland, and the Faroe Islands". ^ "Scandinavia" (2008). In the Merriam-Webster Online Dictionary. Retrieved 9 January 2008: "Scandinavia: Denmark, Norway, Sweden — sometimes also considered to include Iceland, the Faeroe Islands, & Finland." ^ Scandinavia (2001). The Columbia Encyclopedia, Sixth Edition. 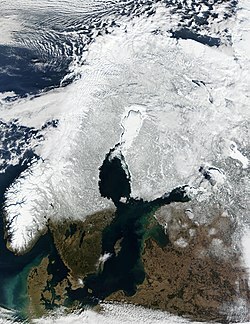 Retrieved January 31, 2007: "Scandinavia, region of N Europe. It consists of the kingdoms of Sweden, Norway, and Denmark; Finland and Iceland are usually considered part of Scandinavia." ^ Scandinavia. The New Dictionary of Cultural Literacy, Third Edition, 2002. Eds. E.D. Hirsch, Jr., Joseph F. Kett, and James Trefil. Retrieved January 31 2007: "Scandinavia. The region in northern Europe containing Norway, Sweden, and Denmark and the peninsulas they occupy. Through cultural, historical, and political associations, Finland and Iceland are often considered part of Scandinavia." ^ Knut Helle. The Cambridge History of Scandinavia: Prehistory to 1520. Cambridge University Press. 2003. ISBN 978-0-521-47299-9. ^ John McKinnell. Meeting the other in Norse myth and legend. Ds Brewer. 2005: 63. ISBN 978-1-84384-042-8.